Marine Lodge01493 331120work Guest AccommodationMarine Lodge in Great Yarmouth enjoys one of the premier locations on the seafront, with superb sea views from many of our rooms. We offer excellent accommodation for your Great Yarmouth holiday in our bright, modern rooms and relaxing public areas including a large balcony seating area. Come and enjoy all the attractions of a top English resort - there is much more to Great Yarmouth than you might think - see the history, walk the beautiful beaches, wine and dine or dance - the choice is yours. Over the last few years we have totally refurbished Marine Lodge, blending modern facilities with the original Victorian architecture for a superb holiday experience. Marine Lodge sometimes limits bookings to 4 or more days. All of our bright and modern bedrooms are en-suite with freeview TV's, tea and coffee making facilities. All prices are based on room only accommodation. Breakfast is available at an extra cost between 8 and 11am. Double sometimes limits bookings to 4 or more days. Double bed with single bed suitable for child. Please note that although the system allows more than 2 adults to be selected, Due to our own terms and conditions no more than 2 adults will be permitted to any one room.And any bookings submitted with more than 2 adults will be cancelled as per the terms and conditions outlined below.All prices are based on room only accommodation. Breakfast is available at an extra cost between 8 and 11am. Double/Single sometimes limits bookings to 4 or more days. Please note that although the system allows more than 2 adults to be selected, Due to our own terms and conditions no more than 2 adults will be permitted to any one room.And any bookings submitted with more than 2 adults will be cancelled as per the terms and condtions outlined below.. All prices are based on room only accommodation. Breakfast is available at an extra cost between 8 and 11am. Family sometimes limits bookings to 4 or more days. King rooms have a king sized bed.All prices are based on room only accommodation. Breakfast is available at an extra cost between 8 and 11am. King sometimes limits bookings to 4 or more days. Marine Lodge in Great Yarmouth enjoys one of the premier locations on the seafront, with superb sea views from many of our rooms. 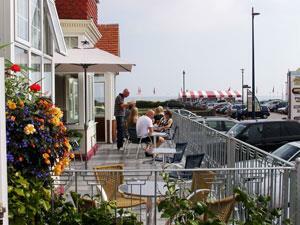 Private car parking, sea front location, wheelchair friendly rooms available. All rooms are ensuite. Breakfast available 8am to 11am. The region is easily accessible by road from all parts of the UK. Major trunk roads into Norfolk are the M11, A11, A12 and the A14 from London and the South-east, while the A47 and A14 serve the Midlands and North. On approaching Great Yarmouth follow signs for SEA FRONT. We are located on the corner of Euston Road and the Seafront. There is a regular local service from Norwich to Great Yarmouth. with connecting trains from Norwich to London, Liverpool Street. Peterborough, Cambridge and Ely.